This section provides information on recent and forthcoming talks concerning democratic decay by the Director of DEM-DEC, Dr Tom Gerald Daly, as well as events co-hosted by DEM-DEC.
Talks before 2018 will be added shortly. DEM-DEC Director Dr Tom Daly is hitting the road at the end of March, attending a range of events and meetings at Princeton, Cardozo, Harvard, and University of Chicago to discuss democratic decay and DEM-DEC.
At Princeton, Tom will be an invited speaker at the conference 'The Other ‘Transitology’: Pathways into and out of Authoritarianism in the Twenty-First Century – Empirical and Normative Perspectives’, organised by the Constitutionalism Under Stress (CONSTRESS) project. He will also attend a RECONNECT project event and meet PhDs conducting research on democratic decay. At Cardozo Law School, Tom will attend the IACL Roundtable 'A Passion for Civil Liberties: Building on the Legacy of Norman Dorsen’ in his capacity as Co-Editor of the IACL-AIDC Blog. At Harvard, Tom will give a talk on 4 April about the design of, and challenges in developing, DEM-DEC, chaired by Professor Mark Tushnet. At University of Chicago, Tom will give a talk on 8 April to students about comparative constitutional design features aimed at protecting democracy. Sincere thanks to Professors Jan-Werner Müller, Mark Tushnet, Tom Ginsburg and Laurent Pech, and to Cassie Emmons and Oren Tamir, for making this tour possible. It will be a great opportunity to connect with leading scholars in the USA. This talk was part of an international conference on ‘Towering Judges’ worldwide, organised by Dr Rehan Abeyratne and Dr Iddo Porat and hosted at the Chinese University of Hong Kong (CUHK) Faculty of Law, and with participants including Mark Tushnet, Ros Dixon, Richard Albert, Mara Malagodi, Gábor Atilla Tóth, Jaclyn Neo and Kevin Tan. My talk, on the first Chief Justice of Ireland, Hugh Kennedy, focused on Kennedy’s famous dissent in a 1934 case, which asserted the power to review constitutional amendments that are contrary to fundamental principles of the rule of law (among other things). The dissent is the earliest example of any judge attempting to assert this power, and predates the Indian Supreme Court’s decision to do so in the Kesavananda case by 40 years. I argued that we need to pay more attention to the sophistication of Kennedy’s judgment, which still has lessons today in the era of democratic decay. When Ran Hirschl decried ‘juristocracy’ in the mid-2000s, the transfer of power worldwide from representative institutions to judiciaries seemed unstoppable. Today, that global trend appears to have hit a wall, often spurred by governments seen as hostile to liberal democracy: the US Supreme Court is increasingly discredited, the constitutional courts of Poland and Hungary have been captured by the executive, Aharon Barak’s judicial revolution in Israel is being reversed, and international human rights courts are struggling to operate. Worse, courts in many states are viewed as having aided the deterioration of democratic rule. However, look closer, and expansive judicial power has simply mutated in the face of perceived threats to liberal democracy: the Indian Supreme Court has sought to build institutional capital against the Modi government through more expansive rights protection; the gaze has shifted to lower courts as democracy defenders in places like Poland and the USA; and, in Europe, the most effective response to the Polish government to date began with a lone Irish High Court judge refusing an extradition request due to concerns about the rule of law in Poland, which has brought the matter before the European Court of Justice. This talk will analyse these recent developments and discuss a fundamental shift: how threats to democratic governance worldwide have softened the boundaries between Waldron’s ‘well-functioning’ democracies (where, he argues, expansive judicial power cannot be justified) and ‘other’ democracies (where a greater role for judicial power might be justifiable to shore up deficiencies in the governance system). On 28 October 2018 Jair Bolsonaro, a pro-dictatorship authoritarian candidate, won the presidential elections in Brazil with 55% of the vote. His election marks, not the beginning of a democratic crisis for Brazil, but the punctuation and intensification of a process of decay that has affected the country’s democratic system for some time. How do we characterise democratic decay in Brazil from a global perspective? In recent years numerous states have fallen to a form of authoritarian populism, which has led public lawyers to analyse how public law is ‘weaponised’ to incrementally hollow out democratic rule, as well as how public law can act as a bulwark against creeping authoritarianism. In states such as Hungary and Poland anti-democratic governments have used law as part of a multi-step ‘masterplan’ to subvert democracy, while in others, such as the USA the picture is more scattered and diffuse, although abuse of law – in the form of extreme gerrymandering and voter suppression, for instance – is also present. Brazil presents an even more complex picture which highlights how democratic decay can arise as a result of multiple forms of populism, different strains of anti-democratic élitism, a constitutional system suffering significant design and implementation flaws, and the lingering legacy – and re-assertion – of military power in politics. More fundamentally, the Brazilian context underscores the highly contested nature of liberal democracy itself, and how the Constitution can become the battleground for competing – if not irreconcilable – visions of state and society. 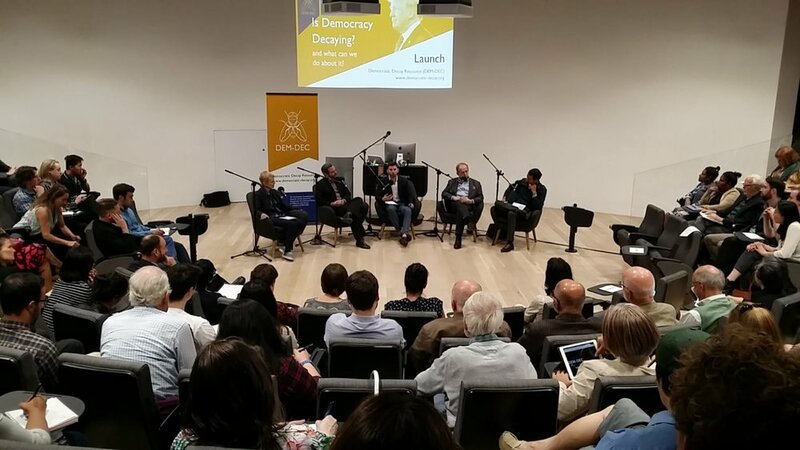 On 22 October DEM-DEC was launched with a panel discussion on ‘Is Democracy Decaying Worldwide? And What Can We Do About It?’. DEM-DEC Director Tom Daly provided a global overview of the deterioration of democracy worldwide before discussion of a variety of country case-studies with leading experts. Many terms are now used to refer to the incremental deterioration of democratic rule worldwide, or ‘democratic decay’. So many, in fact, that it threatens to become a serious problem. Abusive constitutionalism. Populist constitutionalism. Bad faith constitutionalism. De-constitutionalism. Autocratic legalism. Constitutional retrogression. Constitutional capture. Stealth authoritarianism. Authoritarianisation. Constitutional rot. Constitutional decay. Democratic deconsolidation. Democratic backsliding. Authoritarian backsliding. Rule of law backsliding. Democratic erosion. Democratic recession. Illiberal democracy, Majoritarian autocracy. The list goes on. This paper discusses the dramatic proliferation of concepts and terms coined to capture this phenomenon. The paper argues that the duplication of concepts to capture democratic decay threatens to hinder the understanding of, and search for solutions to, this phenomenon, especially across public law, but that simple steps can be taken to mitigate the negative effects of proliferation. Brazil is a useful case-study in the use, and limits, of the term ‘populism’, and the different ways in which the ‘p-word’ is said to influence or threaten liberal democratic constitutionalism. Over a decade of what was often termed left-wing populist governance, under Presidents Lula and Dilma, is viewed in some quarters as having produced not only a revenge of the élites in the “abusive impeachment” of Dilma Rousseff, but also a wider right-wing populism whose Trump-like figurehead, Jair Bolsonaro, is a leading candidate in the 2018 presidential elections. Populism as a term does have some utility in the attempt to capture the growing strength of a particular technology of political messaging and governance in Brazil, and to compare these developments with the rise of populism elsewhere. However, the Brazilian context also emphasises that, when used as the dominant analytical lens, it can impede a fuller appreciation of a complex reality. The concept of illiberal democracy is now widely used but is a problematic term. As an increasing number of states have suffered significant attacks on their democratic systems, such as Hungary or Poland, the term has been used to describe the resulting ‘hybrid’ system of governance fusing elements of democratic and authoritarian rule, viewed as mirroring that in longer-standing governance systems such as Turkey, Russia or Singapore. However, the term is applied to a wide variety of states, of varying levels of political freedom, and which can begin from different starting points (e.g. a ‘democratising’ authoritarian state, or a ‘decaying’ liberal democracy) or relate to a stable and long-established system of governance.